Rubb Buildings Ltd was tasked with designing, manufacturing and erecting two crane liftable buildings to cover offshore pile clusters. The two buildings from Rubb’s new ‘BLE Series’ feature spans of 30m and each measure 35m in length. To increase the overall internal apex height of the manufacturing bays to 20.2m, Harland and Wolff (H&W) asked Rubb to use a 7.3m-high wall constructed out of 40ft containers as the building’s foundation. A custom-designed supporting frame was created to hold the containers together and act as the fixing base for the Rubb BLE structures. 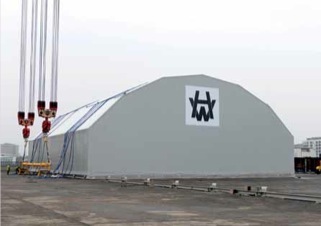 The buildings are designed with reinforced base beams and anchor brackets so they can be easily lifted from their container foundations and moved to one side. This allows the client to then crane lift materials into the space within the foundation frames for various operations. The building roof is replaced to protect employees and materials from the elements. Each gable end of both paint and blast facilities includes a pedestrian door and a 4m × 4m roller shutter door for equipment access. Harland and Wolff has 150 years of marine manufacturing experience. The company, based at Queens Island, Belfast, Northern Ireland, offers a unique combination of vast facilities and technical capability. From initial consultancy through detailed engineering, fabrication and through-life support, H&W are perfectly positioned to support the needs of the maritime, offshore and renewable energy sectors. Rubb Buildings Ltd developed the concept and launched the liftable, moveable, extendable, relocatable BLE range of facilities in 2013. All BLE facilities are equipped with lifting points, providing crane connections which allow the structures to be elevated into position. The BLE Series can also be designed to be mounted and run on a track system to provide a perfect solution for large scale production lines or coverage of ships and dry docks. Buildings are easily extendable and can also be relocated as required. Chris McNally, Harland and Wolff Heavy Industries’ maintenance operations manager, said: “We approached Rubb with a concept of using our gantry cranes to lift a roof on and off a new paint and blast facility to hold subsea weldments at our ever improving and expanding works. We worked closely with Rubb and our structural engineers to design and develop a completely new idea and Rubb supported us throughout. “The quality of the workmanship from the design drawings and loading calculations was impeccable and visits to site from design engineers and directors assisted in a smooth programme of works. The site team worked self- sufficiently and without disruption to our busy daily works and provided two first class liftable buildings and two gable end walls efficiently, to budget, on time and to a very high specification. Rubb Buildings Ltd is renowned worldwide for the design and manufacture of custom-made relocatable engineered fabric structures. Highlights include ground-breaking military buildings (aircraft hangars, shelters, storage facilities), specialist sports buildings and structures for a variety of sectors including aviation, ports, construction, bulk storage and environmental (waste and recycling). All products are designed and manufactured at Rubb’s UK plant at the Team Valley Trading Estate in Gateshead, Tyne and Wear. The company was founded in 1977 and has a proud history of delivering innovative and quality structures to a wide range of clients. The Rubb Group has plants in the USA, Norway, Poland and China.